Filmmaker, producer, cinematographer, animator, and overall cinema pioneer Wolf Koenig passed away on June 26, 2014 at the age of 86. During a prolific career at the NFB, Koenig’s films were lauded for their sophisticated style and what was often a subtle irony in their observation of human behaviour and modern society. 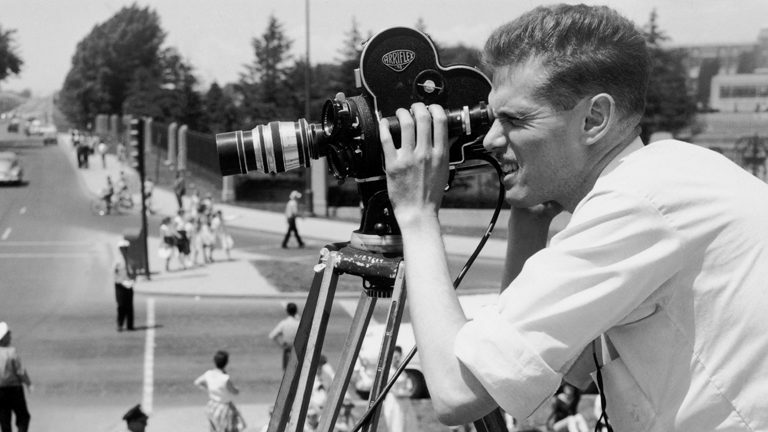 Koenig spent 47 years at the NFB, working on a variety of landmark projects, including Norman McLaren’s Oscar®-winning Neighbours, on which Koenig was cameraman. 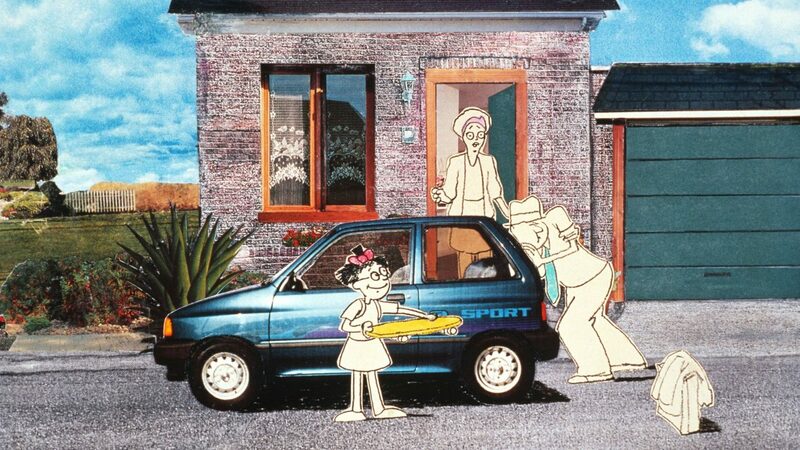 Koenig designed the animation for Colin Low‘s The Romance of Transportation in Canada (1953), winning an award at Cannes. He was also the cinematographer for Corral (1954), Low’s first documentary. The style of this film, with its poetic approach and absence of commentary, was a first in a Canadian documentary production. Koenig was an influential member of the NFB’s Studio B, which sought to interrogate conventional mid-20th-century filmmaking techniques and experiment with the aesthetic aspects of cinema. Along with other Studio B creators Roman Kroitor, Terence Macartney-Filgate, and Tom Daly, Koenig was responsible for a number of key works in the history of documentary film. He co-directed such classics as Glenn Gould – On & Off the Record, a candid portrait of the celebrated eponymous pianist, and Lonely Boy, a short documentary about pop star Paul Anka at the height of his fame. Koenig was also active in and praised for his advancement of the field of animation. The techniques he used in Universe (1960) influenced Stanley Kubrick’s 2001: A Space Odyssey (1968), as Kubrick himself admitted. Koenig served as executive producer of the NFB’s animation studio from 1962 to 1967 and again from 1972 to1975. Near the end of his illustrious career, Koenig worked as a producer on documentaries and animated films (The Great Toy Robbery, What on Earth), and perhaps most notably on Alanis Obomsawin‘s powerful and acclaimed account of the Oka crisis, Kanehsatake: 270 Years of Resistance. Koenig retired from the NFB in 1995. He has cemented a place in Canadian cinema history as one of the founders and innovators of film in this country. If you’d like to hear from the man himself about his techniques and philosophies of filmmaking, check out this extensive interview. Wolf was the son of the late Nathan Koenig and the late Ethel Handel Koenig. He will be remembered with much love and admiration by his brother Joseph (the late Miep de Zwarte), sister Rachel (Achille Byck), nieces Anne (Chris Peacock), Nina (Erik Eryavec), Debbie, Judy (Eric Mlyn), Sarah, and Susan (Stéphane Roy), grandniece Leah Mlyn, grandnephews Adam and Daniel Eryavec, Jonathan and Jeffrey Peacock, Noah Mlyn, Benjamin and Jacob Byck, Jeremy and Jonah Roy, second cousin Evelyne Haendel, goddaughter Amy Arioli, and friends. There is an adage that says when a person dies their life flashes before their eyes; so make sure it is worth watching. Wolf’s life was worth watching. I will always remember Wolf’s enthusiasm, integrity and generosity of spirit. His encouragement changed the direction of my life and for that I will always be grateful. and realize how truly great you were? Did you see that long long line of those you had mentored? those you had loved and who loved you in return? A natural teacher, a loving father. like the majestic wolf you truly were. and set the bar so high. as if you were on the streets of Dresden or Vienna. A European gentleman impeccably dressed and groomed. revealed a vulnerable heart, a gentle soul. and to work alongside you. made my little film shine. I regret that I never had the chance to say goodbye. as you did for so many others. May the angels enfold you now in their loving wings. You always were one of them. “Your exquisite aesthetic and intuitive sense of torytwelling”- it should read “storytelling”. Wolf was one of the Gods at the Board of course, along with Tom Daly, Colin Low, Norman McLaren and Bob Verrall. We had all seen Corral, City of Gold, Lonely Boy and the Glenn Gould films. I started in Challenge for Change, but Wolf soon asked me to edit two documentaries he was exec-producing about Canadian architect, Moshe Safdie. What an extraordinary experience. Wolf was so open and encouraging. I was invited on shoots. Wolf shot some second camera. I shot some third camera too! I was enormously privileged to spend a lot of time with Safdie – who has remained a friend ever since. 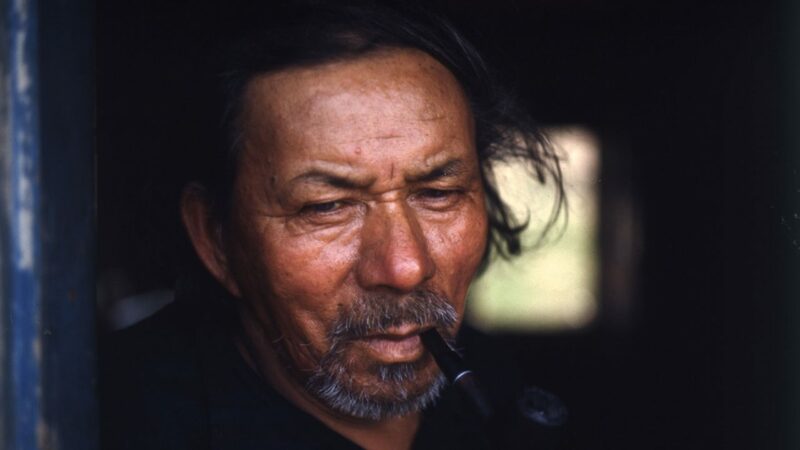 Wolf had a great love of the Inuit people and their art and had started an animation film workshop in Cape Dorset. He asked me, at the tender age of 23, to go there for several weeks in the middle of winter, and make a film about these young Inuit filmmakers. I was put in charge of a seasoned NFB crew. It was an extraordinary responsibility and an exhilarating experience. That’s how it was in those days. Wolf and the other Execs would throw people like me in the deep end and see if we could swim. Wolf did it with such kindness and caring and love. For me, going to Cape Dorset was the beginning of a lifelong love of the Arctic, where I made several films after leaving the Board and starting my own company, 35 years ago. The two wonderful short films Wolf shot with Glenn Gould – On and Off the Record – inspired me, many years later, to make a theatrical documentary about Gould, “Genius Within”. Michele Hozer and I included quite a bit of Wolf’s great footage. As with the film he shot on Paul Anka, “Lonely Boy”, Wolf’s style was to be unassuming and quite. Hovering on the edge of things, he captured wonderfully intimate moments of Glenn Gould rehearsing at his cottage on Lake Simcoe. When Lindalee Tracey and I were married, 25 years ago, Wolf and Joe came to our home with a beautiful round table Wolf had hand made for us in his workshop with lovely turned legs. I visited Wolf a couple of times in Perth when he retired. We had lunch at Fiddleheads in the old limestone mill and reminisced. It was so good to see him and share stories. He was always such a gracious, curious gentleman. So encouraging. Empowering. In the last few years we spoke a few times on the phone. I sent him my films. He sent notes. Hearing from Terry Filgate and Liz Klinck that Wolf was ill and in Toronto, I went to see him early in the morning, a week ago last Friday. The man at the desk had me sign in and directed me to his room. On his floor, a nurse told me Wolf had passed away over night. I’m so sorry I didn’t have the chance to say goodbye and tell him how much he meant to me and to so many others who owe their filmmaking careers to Wolf’s love & encouragement. He is here with us today and forever – in the sunshine. I love you Wolf. Thank you for everything. Wolf and I only had contact when i was narrating a number of films he had been connected with such as ‘Lonley Boy; and the amusing ;The Great Toy Robbery’ (where i did all of the voices) but we spoke often and I had the greatest admiration for his work – I actually have all of the original sound tracks of the Glenn Gould films – all done with Roman, Wolf, and Franz Kramer. Terrific talent. Wolf and I worked closely together in the late sixties. Along with other productions we made Steeltown and I edited the material he had Cartier Bresson shoot for Quebec as seen by Cartier Bresson. I respected him enormously then and will always retain this feeling for him. Rex Tasker. So sorry to hear of Wolf’s passing. He was always a pleasure to work with and such a kind and gentle man. More than 30 years ago Wolfe was the producer and cameraman on the first film I wrote, a short drama titled A Right To Refuse, Exec. Produced by Bob Verrall, about 5 men doing the midnight shift in a boiler room. (The film was shot on an actual midnight shift in a boiler room). The camerawork was brilliant. He truly knew how to get the menace and drama of the environment. Wolfe was working with novices on that production but he was patient, quiet and focused. The film won an award and got my career started and a chunk of that belongs to Wolfe. It occurs to me, than in working with him, I was not just in the presence of a great director, producer, and DP. I was also working with a gentleman. So many of us who were privileged to work under the same roof with Wolf Koenig will link whatever success they had at the NFB to his generous help, and remarkable example. For me,I cannot imagine I would have had a good life there without him. Michel Brault me disait souvent le plus grand bien de Wolf avec qui j’ai aussi eu le plaisir de collaborer,au début des années 60. Sa timidité naturelle était quasi une vertu. Le décès de ce pionnier rappelle avec nostalgie la grande époque hors commerce, quand nous tentions d’inventer une cinématographie nationale à laquelle il a magnifiquement contribué. I am so grateful to have known and worked alongside Wolf during my years at the NFB in Montreal in the 90’s. He was a gentle wise teacher who understood cinema deep into his bones. So sad to hear that we have lost a Canadian cinema icon. Such a loss. I feel fortunate to have had the opportunity to work closely with Wolf when I was his cameraman on two of the Atlantis/NFB dramas, JOHN CAT and CONNECTION. It was fun working with Wolf. His energy and enthusiasm was infectious, and so the experience of working with him was a great pleasure. We have lost a wonderful man and filmmaker and I shall remember him with great fondness. In my time at the Board I never met anyone more generous with his time and talent than Wolf. He was a great filmmaker, yes, but even that was eclipsed by his desire and ability to inspire others, especially young people. Once, a long, long time ago when I was young, he helped me with a camera problem. He didn’t tell me what to do, but he gave me the space – and the desire, and a few hints – to figure it out myself (or so I thought). Then he congratulated me for solving the problem. He was a self-effacing giant. I will miss him. Paul Cowan. Wolf was a wonderful human being as well as a talented filmmaker. I will always remember the gracious and tactful help which he gave to me as a novice working in the medium.